Kari Studley wins the women's title at the Single Speed Cyclocross World Championship. 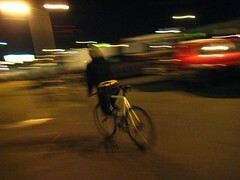 Read about it on Velo Bella. More info over at the official SSCXWC site. Beautiful fall weather was on tap this weekend. Saturday was a packed day of bike related goodness for me. I headed north and crossed the Mason-Dixon line early in the morning to crash a meeting of mountain bike minds comprised of PA club leaders. A couple of state workers discussed various grants and processes that apply to trail projects on Pennsylvania lands. This was followed by a good discussion of Bike Friendly Communities and the idea of "Downtown To Dirt", linking communities to singletrack so you can stay on your bike and out of your car. Good stuff, we need more of this and I'm trying to work on things locally to help move this along. Of course, funding is always an issue, especially in these tough economic times. 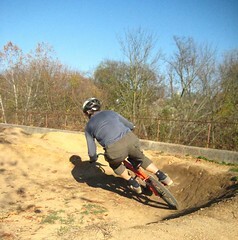 After the meeting, we went up the street to hit the Chambersburg pump track. I've been using my 26" wheeled Surly 1x1 for this type of stuff but Larry and Buck brought 20" BMX bikes and I have to say, you can definitely build up the speed faster on the little bikes. Lots of fun and lots of kids out riding the track. Cool to see the next generation out there. So after I got home I decided to start searching for a BMX bike to add to the mix. Buck's friend trash picked his, so I figured that was one option; keep my eyes peeled around town. Before that though, I figured I'd check out the local Freecycle listing. With luck I found a Redline listed a few days before and after a few emails I was off to picked it up this morning. A little air in the tires and it's good to go. Score! I guess things come full circle, as the last BMX bike I owned many, many years ago, was a Redline. Big thanks to the organizers and volunteers for putting it on. And if you missed, well maybe next year it will return.